Sunscreens | The Medical Letter, Inc. Excessive exposure to ultraviolet (UV) radiation is associated with sunburn, photoaging, and skin cancer.1,2 Sunscreens are widely used to reduce these risks, but some questions remain about their effectiveness and safety. UVA and UVB — UV radiation capable of injuring the skin is classified based on wavelength as UVA1 (340-400 nm), UVA2 (320-340 nm), and UVB (290-320 nm). UVA, which makes up 95% of terrestrial UV radiation, penetrates the dermis and causes long-term damage. UVB, which is mostly absorbed in the epidermis, is largely responsible for the erythema of sunburn. Both UVA and UVB can cause photoaging and skin cancer. UVB is strongest at midday and is present primarily in late spring, summer, and early autumn in temperate climates. UVA is constant throughout the day and the year and, unlike UVB, is not filtered by clear glass. SPF — Sun Protection Factor (SPF) is the ratio of the time required to develop a minimally detectable sunburn while wearing a sunscreen product to the time required without wearing the product. It represents the fraction of erythema-producing UV light (primarily UVB) that penetrates through the product to reach the skin. When properly applied, an SPF 15 sunscreen allows penetration of 1/15th (7%) of erythemogenic UV photons, an SPF 50 sunscreen transmits 1/50th (2%), and an SPF 100 sunscreen transmits 1/100th (1%). Accordingly, SPF 50 and 100 sunscreens are only moderately more protective than SPF 15 sunscreens: 98% or 99% vs 93%. VITAMIN D AND SUNSCREENS — Most people require only 2-8 minutes of unprotected exposure to summer sun to maximize synthesis of vitamin D3. Whether sunscreen use could lead to vitamin D3 deficiency is unclear. PROTECTIVE CLOTHING — Clothing can block UV exposure. Factors that affect the level of UV protection from clothing include fabric color, fabric type, and tightness of the weave. The ultraviolet protection factor (UPF) is a measure of how effective a fabric is at blocking UV radiation; a rating of 15-24 indicates good protection, 25-39 very good protection, and 40-50 excellent protection. Washing clothes with RIT Sun Guard can confer a UPF of 30. CONCLUSION — Routine application of adequate amounts of a broad-spectrum sunscreen with an SPF ≥15 protects against sunburn, photoaging, non-melanoma skin cancer, and probably melanoma as well. Whether systemic absorption of small amounts of sunscreen ingredients could be harmful remains to be determined, but currently available data suggest that the benefits far outweigh the risks. U Panich et al. Ultraviolet radiation-induced skin aging: the role of DNA damage and oxidative stress in epidermal stem cell damage mediated skin aging. Stem Cells Int 2016; 2016:7370642. M Arnold et al. Global burden of cutaneous melanoma attributable to ultraviolet radiation in 2012. Int J Cancer 2018 April 16 (epub). Questions and answers: FDA announces new requirements for over-the-counter (OTC) sunscreen products marketed in the U.S. June 23, 2011. Available at: www.fda.gov. Accessed August 2, 2018. US Preventive Services Task Force. Behavorial counseling to prevent skin cancer: US Preventive Services Task Force recommendation statement. JAMA 2018; 319:1134. AAD statement on the safety of sunscreen. American Academy of Dermatology. October 22, 2015. Available at: www.aad.org. Accessed August 2, 2018. A new sunscreen agent. Med Lett Drugs Ther 2007; 49:41. JB Mancuso et al. Sunscreens: an update. Am J Clin Dermatol 2017; 18:643. H Ou-Yang et al. High-SPF sunscreens (SPF ≥70) may provide ultraviolet protection above minimal recommended levels by adequately compensating for lower sunscreen user application amounts. J Am Acad Dermatol 2012; 67:1220. JC van der Pols et al. Prolonged prevention of squamous cell carcinoma of the skin by regular sunscreen use. Cancer Epidemiol Biomarkers Prev 2006; 15:2546. C Ulrich et al. Prevention of non-melanoma skin cancer in organ transplant patients by regular use of a sunscreen: a 24 month, prospective, case-control study. Br J Dermatol 2009; 161 (suppl 3:78). MC Hughes et al. Sunscreen and prevention of skin aging: a randomized trial. Ann Intern Med 2013; 158:781. CG Watts et al. Sunscreen use and melanoma risk among young Australian adults. JAMA Dermatol 2018 July 18 (epub). AC Green et al. Reduced melanoma after regular sunscreen use: randomized trial follow-up. J Clin Oncol 2011; 29:257. AR Heurung et al. 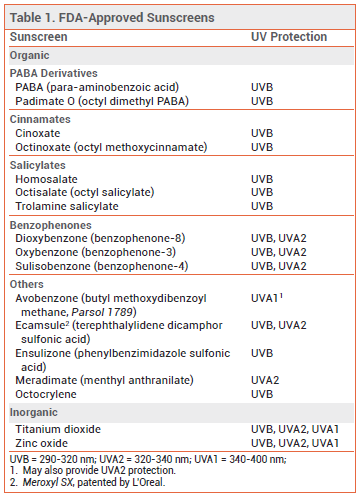 Adverse reactions to sunscreen agents: epidemiology, responsible irritants and allergans, clinical characteristics, and management. Dermatitis 2014; 25:289. NR Janjua et al. Systemic absorption of the sunscreens benzophenone-3, octyl-methoxycinnamate, and 3-(4-methyl-benzylidene) camphor after whole-body topical application and reproductive hormone levels in humans. J Invest Dermatol 2004; 123:57. GM Buck Louis et al. Urinary concentrations of benzophenone-type ultraviolet radiation filters and couples’ fecundity. Am J Epidemiol 2014; 180:1168. H Krause et al. Presence of benzophenones commonly used as UV filters and absorbers in paired maternal and fetal samples. Environ Int 2018; 110:51. SQ Wang et al. Safety of oxybenzone: putting numbers into perspective. Arch Dermatol 2011; 147:865. JA Ruszkiewicz et al. 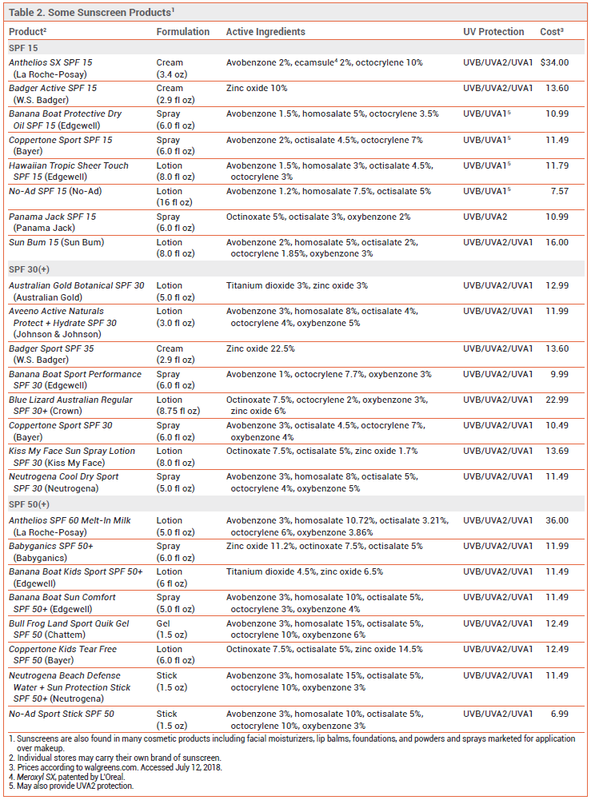 Neurotoxic effect of active ingredients in sunscreen products, a contemporary review. Toxicol Rep 2017; 4:245. Australian Government Department of Health. Therapeutic Goods Administration. Literature review on the safety of titanium dioxide and zinc oxide nanoparticles in sunscreens. January 11, 2017. Available at: www.tga.gov.au. Accessed August 2, 2018. CA Downs et al. Toxicopathological effects of the sunscreen UV filter, oxybenzone (benzophenone-3) on coral planulae and cultured primary cells and its environmental contamination in Hawaii and the U.S. Virgin Islands. Arch Environ Contam Toxicol 2016; 70:265. SL Schneider and HW Lim. Review of environmental effects of oxybenzone and other sunscreen active ingredients. J Am Acad Dermatol 2018 June 28 (epub). AS Paller et al. New insights about infant and toddler skin: implications for sun protection. Pediatrics 2011; 128:92. P Isedeh et al. Teaspoon rule revisited: proper amount of sunscreen application. Photodermatol Photoimmunol Photomed 2013; 29:55. Insect repellents. Med Lett Drugs Ther 2016; 58:83.